So in yesterday's post I mentioned this awesome giveaway...if not that Bobo is not around I would have grabbed this offer, but wetin only me wan go do for there? LOL. 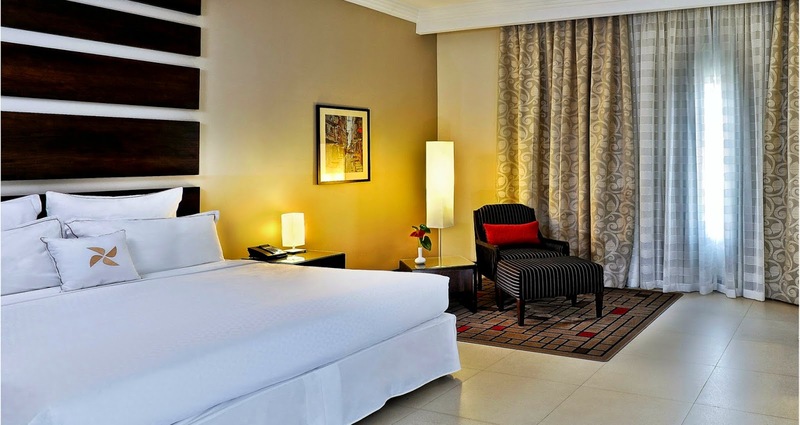 So now YOU have the opportunity to win this courtesy Four Points Lagos! Valentine is knocking on the door, incase you're one of those people that didn't plan because of elections, this giveaway can actually redeem you. What is on offer? A weekend stay for TWO inclusive of breakfast and dinner! Oh la la! 2. 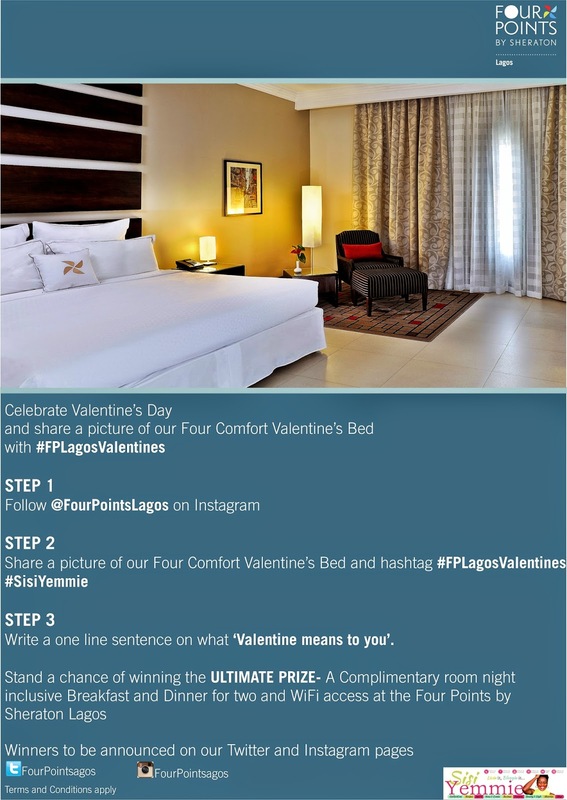 Tweet this picture below with the hashtag #FPLagosValentines #SisiYemmie + a short line about what valentine is to you! 2. Upload this photo below (or the video I uploaded yesterday @sisi_yemmie) with the hashtag #FPLagosValentines #SisiYemmie + a short line about what valentine is to you! You can also leave a comment on this post + your email address + a short line about what valentine is to you! Seriously, it's too easy! You can enter on behalf of your friend, family, anyone, as long as the winner can come claim the prize! I really want someone to get this deal this Valentine....mwaaah! Honestly...Valentine these days is all about consumerism..everyone trying to sell you something with a bit of red and hearts and a day meant only for only couples and selfies before it was about sharing love with friends, family and loved ones..not anymore. I love your blog sisiyemmie!!!! Valentine is the day we share love with h those who matters to us. Love is about giving and not neccesarily taking,if everyone could see love in that light,the world would be a better place. Just like what sisyemmie is doing now. She understands the value of giving and ultimately the value of love. Hello sisiyemmie your blog is the best. Valentine to me,is a moment of connection and love among two people who mean a lot to each other. Love brings us closer,valentine marks a day to remember the importance of love. as i dont have any Bae in my life at the moment not going to enter this giveaway but will help share it on my social media someone may have need for it. I hope to win. mails4nk@yahoo.com. valentine is a time to show love to people around us. A time to take that extra step in appreciating people. Not just to our loved ones but to everyone. I truly love celebrating the season of love. valentine is a special day set aside on the calender every february14,it is also a day to show love to the one after your heart especially. Valentine is about caring, sharing, loving and of course just taking out time to appreciate my boo all over again. Awww! Wish I could apply but don't live in Lagos. I need this in my life right now. She stared at him like he were an unusually large bloodsucking insect hovering within her air space.She looked more like she was about to grab the table knife and stab him with it…….twice. Wot sorro embarazzmen iz dizz?”Hawt chick spat as she menacingly rose from her seat. And yes, those were her exact words ….or sounds. At that point, I and my friend exchanged curious glances.I think we telepathically asked ourselves in unison “Is that how she talks???? obinwamma@gmail.com, valentine to me means reaffirming the love you have for your significant other and to your family too. samuelabutu2@gmail.com, Valentine to me is a time when you and your wife take yourselves out to that lovely place remind yourselves of how much you love and cherish each other with lovely gifts exchange. JOIN THE DEBATE: WHAT COLOURS ARE ON THIS DRESS? YAM POTTAGE RECIPE - VIDEO! 6 REASONS YOU NEED A SIDE HUSTLE !